Craig Flaherty, left, and Ron Araujo of Eversource during a home energy solutions inspection in Darien. DARIEN — Craig Flaherty has always been passionate about the environment, whether he’s helping the town convert to single stream recycling or recently, getting his home inspected for energy saving solutions. 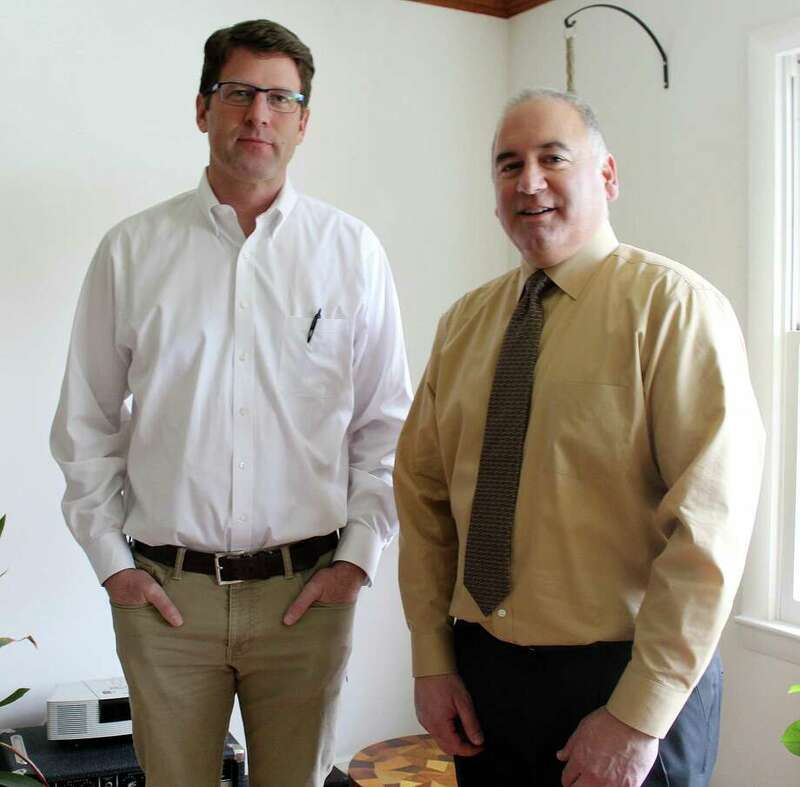 On April 14, Flaherty, Chairman of Darien’s Energy and Recycling Advisory Committee, welcomed Eversource into his home to help find ways to better conserve energy. If requested, Eversource-authorized contractors will come to a house and look for drafts that can be air sealed, test pipes to save water and swap out regular light bulbs with LED light bulbs. Flaherty allowed inspectors to examine the safety of his home and rummage through bedrooms and closets, looking for drafts with the help of a fan installed to a side door, all in the name of energy efficiency. The process takes about a half day and helps homeowners find ways to save on heat and hot water and gives them further advice on how to protect their home. The service, which will come to Darien residents via letter in a few weeks, is part of a commitment Darien made to Eversource to be a clean energy community by 2020, meaning the municipal will reduce energy costs by 20 percent. “We’re doing municipal projects to release energy opportunities and show homeowners the benefits of energy saving measures at home,” First Selectman Jayme Stevenson said. The service costs $124 and often comes with recommendations and discounts for recommended home services. Flaherty said he’d had a similar service done to his old house about a decade ago and was prepared to face needing weather sealant and new insulation for his attic. Araujo said that though many participants look forward to the installation of LED light bulbs that come with the service, many homeowner benefit from adding caulking and sealing to their drafts, which helps keep hot and cold weather out of their home. The service is part of a green mindset that’s spreading in town as part of their clean energy community pledge. Darien has recently begun a trend of disposing of more recyclables than solid waste over the past several months, thanks to single stream recycling put in place by the Energy and Recycling Advisory Committee. The town is also working on at a natural gas expansion that would extend from Post Road to West Avenue on the Stamford border and convert the business, homes and schools there to natural gas. “The town of Darien has become a leader in recycling and energy efficiency initiatives,” Stevenson added.